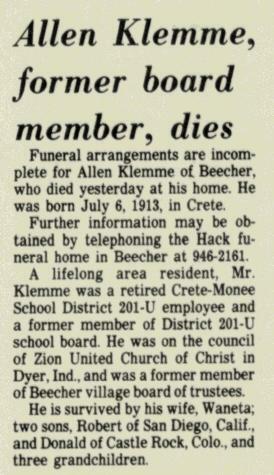 Name Variation Allen A. Klemme was also known as Allan. Allen A. Klemme was born on 6 July 1913 at Illinois. Allen A. Klemme married Waneta (?) on 26 December 1938. 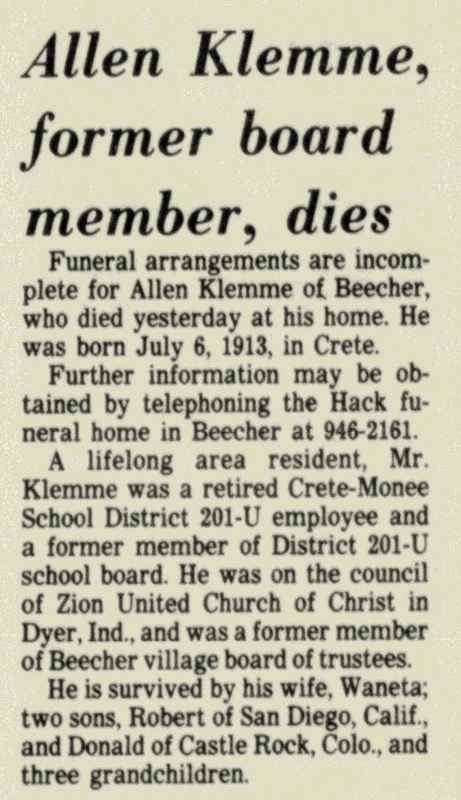 Allen A. Klemme died on 11 August 1984 at Beecher, Will, Illinois, at age 71 Park Forest Star August 12, 1984 - Allen Klemme obituary. Allen A. Klemme obtained US Social Security Card at Illinois; last residence Beecher, Will, Illinois. 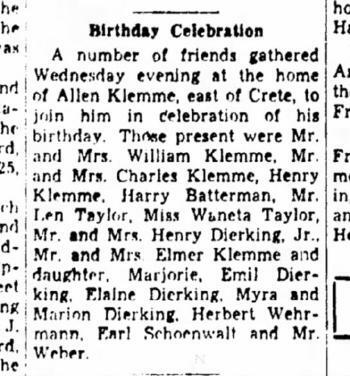 He lived with Wilhelm Klemme in 1918 at Crete, Will, Illinois.3 On 12 July 1938 at Birthday celebration for Allen Klemme. Name Variation Pearl Linda Claus was also known as Linda. Married Name circa 1915 As of circa 1915,her married name was Klemme. Pearl Linda Claus was born circa 1896 at Indiana. She married Arthur Walter Klemme, son of Christoph Karl Klemme and Maria Emilie Anna Claus, circa 1915. Pearl Linda Claus lived with Arthur Walter Klemme in 1918 at Crete, Will, Illinois.3 In January 1956 attended Mrs Charles H Klemme Sr (Maria Claus) birthday party. Mildred Klemme was born circa 1918 at Illinois. She was the daughter of Arthur Walter Klemme and Pearl Linda Claus. Married Name circa 1906 As of circa 1906,her married name was Klemme. 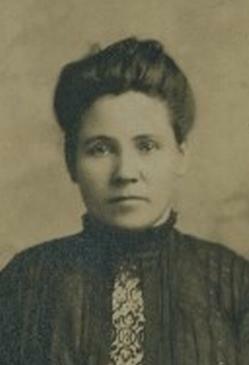 Anna K. D. Hinrichs was born in 1880 at Illinois also reported as circa 1885. She was the daughter of Prismer Hinrichs and unknown (?). Anna K. D. Hinrichs married Heinrich Gustav Friedrich Klemme, son of Heinrich Christian Klemme Jr. and Maria Dorothea Sophia Grages, circa 1906. Anna K. D. Hinrichs was buried in 1941 at Adams Cemetery, Crete, Will, Illinois. Name Variation Frederick H. Klemme was also known as Fred Klemme Jr.
Frederick H. Klemme was born on 4 August 1906 at Illinois. He was the son of Heinrich Gustav Friedrich Klemme and Anna K. D. Hinrichs. Frederick H. Klemme died on 6 September 1993 at age 87. He was buried after 6 September 1993 at Adams Cemetery, Crete, Will, Illinois. Name Variation Rudyard E. Klemme was also known as Rudy. Rudyard E. Klemme was born on 17 December 1908 at Crete, Will, Illinois. Rudyard E. Klemme married Margaret Genevieve Miller in September 1943. Rudyard E. Klemme was buried in December 1978 at Wheatfield Cemetery, Wheatfield, Jasper, Indiana. He died in December 1978 at Jasper, Indiana, Rudyard E. Klemme, 70, of Rt. 2, Wheatfield, died at 1 p.m. Saturday in Jasper County Hospital. 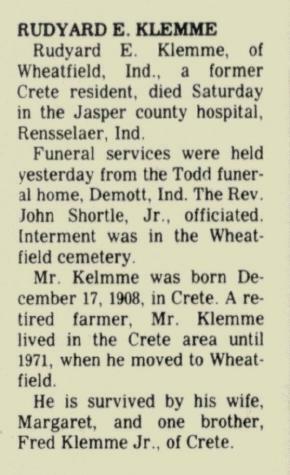 Born in Crete, Ill., on Dec. 17, 1908, he was a son of Fred and Ann (Hendrix) Klemme. He was married to Margaret Miller on Sept. 18, 1943, in Chicago Heights, Ill.
A resident of the Wheatfield area since 1971, he was a retired farmer. Surviving with the wife is one brother, Fred Klemme Jr., of Crete, Ill.
Funeral services will be conducted from Todd Funeral Home, DeMotte, at 1 p.m. Wednesday with the Rev. John Shortle Jr. officiating. Interment will follow in Wheatfield Cemetery. Rudyard E. Klemme obtained US Social Security Card at Illinois; last residence Wheatfield, Jasper, Indiana. He lived with Heinrich Gustav Friedrich Klemme in 1918 at Crete, Will, Illinois.4 In September 1968 Rudy and Marjorie Klemme 25th wedding anniversary celebration. Ann (?) married Caleb Mercer, son of Solomon Mercer and Abigail Sharpless. Ann (?) was born circa 1788 at Pennsylvania. 19 August 1850 East Marlborough, Chester, Pennsylvania Ann (?) was listed as the head of a family on the 1850 Census at East Marlborough, Chester, Pennsylvania, Dwelling 229..
Sarah E. Mercer was born circa 1830 at Pennsylvania. She was the daughter of Caleb Mercer and Ann (?). 19 August 1850 East Marlborough, Chester, Pennsylvania Sarah E. Mercer was listed in Caleb Mercer's household on the 1850 Census at East Marlborough, Chester, Pennsylvania; Dwelling 229. Name Variation Louisa Robinett was also known as Louisa Robnett. Louisa Robinett was born on 26 January 1863 at Bay City, Pope, Illinois. She was the daughter of Jonathan Robnett and Ellen Tanner. Louisa Robinett died on 9 January 1875 at age 11. Name Variation John Robnett was also known as John Robinett. John Robnett was born on 18 October 1867 at Bay City, Pope, Illinois. He was the son of Jonathan Robnett and Ellen Tanner. 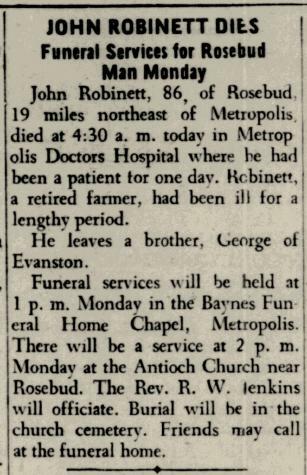 John Robnett died on 9 May 1953 at age 85 John Robinett obituary. He was buried after 9 May 1953 at Antioch Cemetery, Rosebud, Pope, Illinois. [S186] Illinois, Illinois Statewide Marriage Index, volume A-1/page 189 license 1650. [S245] U.S. Federal Census 1900 U.S. Federal Census, by Ancestry.com, ED63. Dwelling 140. [S244] U.S. Federal Census 1910 U.S. Federal Census, by Ancestry.com, ED87. Dwelling 59. [S243] U.S. Federal Census 1920 U.S. Federal Census, by Ancestry.com, ED93. Dwelling 13. [S250] U.S. Federal Census 1930 U.S. Federal Census, by Ancestry.com, ED64-13. Dwelling 259. Married Name 28 January 1937 As of 28 January 1937,her married name was Hawkes. Evelyn Margaret Hrdlicka was born on 22 February 1914 at South Dakota. Evelyn Margaret Hrdlicka married Orville Kenneth Hawkes, son of William P. Hawkes and Emma F. Youngstrom, on 28 January 1937 at Charles Mix, South Dakota. [S373] U.S. Federal Census 1940 U.S. Federal Census, by Ancestry.com, Year: 1940; Census Place: Marysville, Yuba, California; Roll: T627_367; Page: 5B; Enumeration District: 58-11. [S228] High School High School, by South Dakota. Name Variation Elizabeth Ida Rister was also known as Ryster. Name Variation Elizabeth Ida Rister was also known as Lizzie. Name Variation Elizabeth Ida Rister was also known as Ida Elizabeth. Married Name 22 February 1881 As of 22 February 1881,her married name was Beckett. Elizabeth Ida Rister was born in 1865 at Wisconsin. Elizabeth Ida Rister died on 9 January 1937. She was buried after 9 January 1937 at Greenwood Cemetery, Platteville, Grant, Wisconsin. Elizabeth Ida Rister had 6 with 6 living in 1900 children. She had 6 with 6 living in 1910 children. She lived in 1911 at Platteville, Grant, Wisconsin. [S5] Wisconsin, Wisconsin Marriages, 1835-1900, listed under Ryster, Elizabeth. [S245] U.S. Federal Census 1900 U.S. Federal Census, by Ancestry.com, ED50. Dwelling 54. [S244] U.S. Federal Census 1910 U.S. Federal Census, by Ancestry.com, ED41. Dwelling 278. [S243] U.S. Federal Census 1920 U.S. Federal Census, by Ancestry.com, ED120. Dwelling 87. [S250] U.S. Federal Census 1930 U.S. Federal Census, by Ancestry.com, ED22-44. Dwelling 117. [S187] Grant WI Birth Records Birth Records, by Wisconsin, V1-0972. Name Variation Ollie Mae Rister was also known as Othie. Name Variation Ollie Mae Rister was also known as Olive. Married Name 4 July 1889 As of 4 July 1889,her married name was Shinoe. Ollie Mae Rister was born circa 1872 at Wisconsin. Ollie Mae Rister died on 12 January 1904 at North Dakota. Ollie Mae Rister and John Lewis Shinoe lived in 1901 at Bottineau, North Dakota. Ollie Mae Rister had eight children. Married Name 1 January 1892 As of 1 January 1892,her married name was Taylor. Rebecca Rister was born on 23 November 1872 at Wisconsin. Rebecca Rister died on 16 June 1960 at age 87. She was buried after 16 June 1960 at IOOF Cemetery, Marengo, Iowa, Iowa. Rebecca Rister had 1 with 1 living in 1900 children. She had 1 with 1 living in 1910 children. She lived in 1911 at Platteville, Grant, Wisconsin. [S245] U.S. Federal Census 1900 U.S. Federal Census, by Ancestry.com, ED47. Dwelling 34. [S244] U.S. Federal Census 1910 U.S. Federal Census, by Ancestry.com, ED107. Dwelling 233. (?) Hildebrandt was born at Germany. Married Name Her married name was Hildebrandt. Unknown (?) married (?) Hildebrandt. Max P. Hildebrandt+ b. 30 Apr 1890, d. Jul 1985;One of Joseph Mercer's daughters - either Mary, Jane Eliza or Edith. Mother* unknown (? );One of Joseph Mercer's daughters - either Mary, Jane Eliza or Edith. Max P. Hildebrandt was born on 30 April 1890 at Wisconsin. He was the son of (?) Hildebrandt and unknown (?). Max P. Hildebrandt married Myra L. Minard, daughter of Thomas H. Minard and Mary E. Mercer, circa 1914. Max P. Hildebrandt died in July 1985 at age 95. Max P. Hildebrandt obtained US Social Security Card at Long-time or retired railroad workers; last residence Stoughton, Dane, Wisconsin. Name Variation Myra L. Minard was also known as Myra E.
Married Name circa 1914 As of circa 1914,her married name was Hildebrandt. Myra L. Minard was born in February 1886 at Wisconsin also reported as 1889. She was the daughter of Thomas H. Minard and Mary E. Mercer. Myra L. Minard married Max P. Hildebrandt, son of (?) Hildebrandt and unknown (? ), circa 1914. 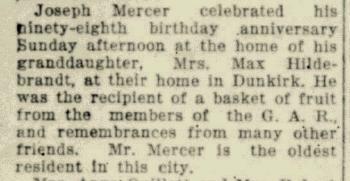 Myra L. Minard witnessed the death of Joseph Custard Mercer Jr on 13 August 1924 at Stoughton, Dane, Wisconsin; Joseph C Mercer Jr obituary; also written as Stolen and reported as 1926. Myra L. Minard died in 1930. 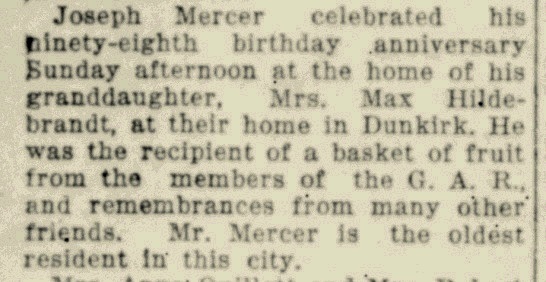 In March 1924 at home of his granddaughter Myra, Dunkirk, Wisconsin, Joseph C Mercer Jr celebrates 98th birthday. Name Variation Thomas H. Minard was also known as T. H.
Thomas H. Minard was born in March 1845 at Vermont also reported as 1838. He married Ellen C. Mowe, daughter of Daniel Mowe and Mary Jane (? ), before 1870. Thomas H. Minard married Mary E. Mercer, daughter of Joseph Custard Mercer Jr and Elizabeth Stull, circa 1885. Thomas H. Minard was buried in 1921 at Riverside Cemetery, Stoughton, Dane, Wisconsin. [S247] U.S. Federal Census 1870 U.S. Federal Census, by Ancestry.com, Page 4. Dwelling 27. [S246] U.S. Federal Census 1880 U.S. Federal Census, by Ancestry.com, NA Film Number T9-1444 Page Number 390A. Married Name 28 April 1938 As of 28 April 1938,her married name was Petty. Alice M. Hildebrandt was born on 19 June 1915 at Wisconsin. She was the daughter of Max P. Hildebrandt and Myra L. Minard. Alice M. Hildebrandt married Ben L. Petty on 28 April 1938. Alice M. Hildebrandt died on 15 February 2009 at age 93 Alice M. Petty, age 93, lifetime Stoughton resident, went to be with the Lord Sunday, February 15, 2009, at Stoughton Hospital. Mrs. Petty was born in Stoughton, Wisconsin, on June 19, 1915, to Max and Myra (Minard) Hildebrandt. She was one of three children. Alice graduated from Stoughton High School in 1933. While in high school, Alice met the love of her life, Ben L. Petty. They were married on April 28, 1938, in Stoughton. Ben predeceased Alice in February 2008. They were blessed with three children, two daughters, Barbara J. (David) Anderson of Chandler, Arizona, Judy M. (Du Wayne) Kittleson of Stoughton; and one son, Donald J. Petty of Stoughton. Alice Petty is also survived by nine loving grandchildren, Scott (Amy) Anderson of Stoughton, Bruce and Mark Anderson of Chandler, Arizona, Rema (DJ) Denruiter of Sun Prairie, Dan (Jerri) Kittleson of Stoughton, LeAnne (Brian) Anderson of Minneapolis, Minnesota, Ben and Samantha Petty of Stoughton, and Christina Wright of Scranton, Pennsylvania. "Grandma Petty" was a joy to share time with. Her dry sense of humor kept us all in stitches and many are the sayings that we will all treasure that we first heard from Mom. She was loving and generous to all of us and taught us many things throughout the years. Alice was very active in her love of God. For years she played the piano at Christian Assembly Church. She loved to write religious poems, she regularly played the piano and entertained at various nursing homes. She was active for years as a Stoughton Hospital volunteer. She loved to sew, knit, bake, and take care of all her house plants. In her early years, she drove taxi for Stoughton Taxis, and helped her father sell vegetables door to door around Lake Kegonsa. Alice loved the Lord with all her heart and was a longtime member of the Christian Assembly Church here in Stoughton. She is survived by her children, grandchildren, great-grandchildren; and two sisters-in-law, Ionia G. Erickson of Stoughton, and Murial Hildebrandt of Stoughton. Further surviving are many nieces and nephews, and a great many friends that she acquired throughout her long and happy life. She was predeceased by her husband, Ben; her parents; siblings, Robert Hildebrandt and Mary (Bill) Borgen; stepmother, Maude Hildebrandt; and her in-laws, Elsie and Ernest Mortenson. Funeral services will be held on Wednesday, February 18, 2009, at 11 a.m. at the funeral home with the Reverend David Handt officiating. Burial will follow in Riverside Cemetery. Robert Yearsley was born in 1752. He was the son of Thomas Yearsley and Hannah Mercer. Robert Yearsley died in 1839. Isaac Yearsley was born on 3 November 1754. Isaac Yearsley died on 19 April 1834 at age 79. Thomas Yearsley Jr. was born circa 1759. Thomas Yearsley Jr. died on 11 November 1809. Lydia Yearsley was born circa 1747. She was the daughter of Thomas Yearsley and Hannah Mercer. Nathan Yearsley was born in 1762. Nathan Yearsley died circa 1829. Patience Yearsley was born circa 1760. Patience Yearsley died on 5 December 1828. Hannah Yearsley was born on 1 March 1763. Married Name Her married name was Eavenson. Ann Yearsley was born on 21 January 1757. Robert J. Zick was born on 22 December 1904 at Wisconsin. He was the son of John F. Zick and Minna Selma Mellenthin. 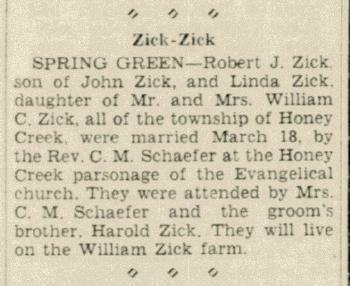 Robert J. Zick married Linda Ruth Zick, daughter of William Christian Zick and Ida Augusta Klipstein, on 18 March 1936 at Honey Creek, Sauk, Wisconsin, Robert J Zick and Linda Zick marriage announcement. Robert J. Zick died on 10 September 1993 at Wisconsin at age 88 Robert J Zick obituary. Robert J. Zick obtained US Social Security Card at Wisconsin; Last residence Prairie Du Sac, Sauk, Wisconsin. 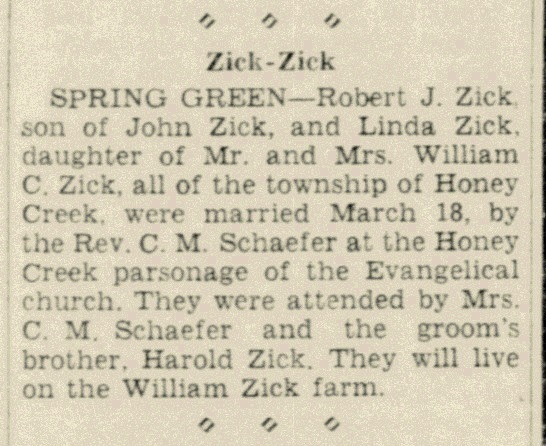 Harold Leslie Zick was the best man at the wedding of Robert J. Zick and Linda Ruth Zick on 18 March 1936 at Honey Creek, Sauk, Wisconsin; Robert J Zick and Linda Zick marriage announcement. Harold Leslie Zick died on 1 February 1986 at age 79. Harold Leslie Zick obtained US Social Security Card at Wisconsin; Last residence Prairie Du Sac, Sauk, Wisconsin. [S358] Wisconsin Pre-1907 Vital Records (published), Birth Record ID: 3323869.